Woolly was born to spread friendship and communication with the Trailhead gang over at Salesforce. 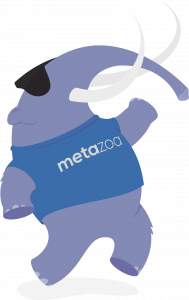 We felt they needed a buddy from Team Metazoa, a facilitator who could lead the charge to integrate mascot operations (since our companies are so intertwined in the real world). We can’t divulge just how closely we’re working with the “de-extinction” team over at Harvard — they got ahold of some of Woolly’s distant cousin’s DNA in Siberia and are now hoping to create a “mammophant” by 2020. Lots of non-disclosure agreements and all that, since the legal teams have the Jurassic Park jitters, you know? But let’s just say we’ve all spent some quality time in the laboratory tinkering and creating. We’re all part of one big inclusive Proboscidean family, especially since our Woolly is actually a mastodon (smaller, more cuddly, but with the same swell disposition as any self-respecting mammoth). We put on our lab coats because we knew we needed a buddy mastodon — one always sporting a smile between his tusks — who would be ready to blaze new trails with the Trailhead gang whenever it was time to hit the road. 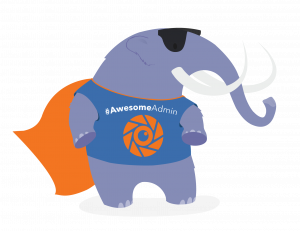 An evangelist for our #AwesomeAdmin pals and an official mascot go-between who could spread some fun and ensure that everyone’s happy and on the same page.